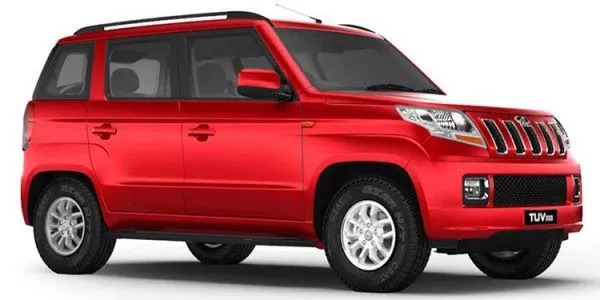 The TUV300 is definitely a far better looking SUV than the old Quanto which actually looks like a smaller version of the Xylo SUV. 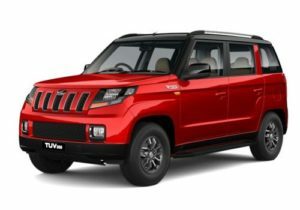 The TUV300 definitely has its own unique identity which is its biggest point. What also sets it apart is the fact that it actually shares its chassis structure with the new generation Scorpio. Coming to the styling the TUV300 looks rugged and its design has been inspired from a battle tank. Towards the front it gets this huge and bold looking grille and clear lens headlamps with well designed turn indicators. The front bumpers get rectangular fog lamps and even a rectangular air dam. The front bonnet also gets a bold design which actually helps in giving the SUV a commanding road presence. Now if we take a look closely you will notice that the front grille takes some of its inspirations from Jeep which is totally acceptable because Mahindra has added their own flavors to it. The side profile of the SUV’s styling somehow helps to distract your mind from the overall boxy design of this compact SUV because it gets slightly slanting B pillar which actually seems to have worked in Mahindra’s favor, plus the addition of blacked out B and D Pillar definitely adds the premium feel to the overall exterior. The rest of the side profile gets squarish looking wheel arches and an impressive ground clearance which helps it stick to its true blue SUV character. The side profile also gets stylish roof rails too which can help in easy mounting of lifestyle accessories and other useful things. Towards the rear the first thing which will attract your attention is the spare wheel mounted on the tailgate while the large wrap around taillamps helps in giving the SUV contemporary styling.